Digital art is an exciting area! It provides you with options not available with traditional media. You will have a virtual art store with all the art supplies imaginable. 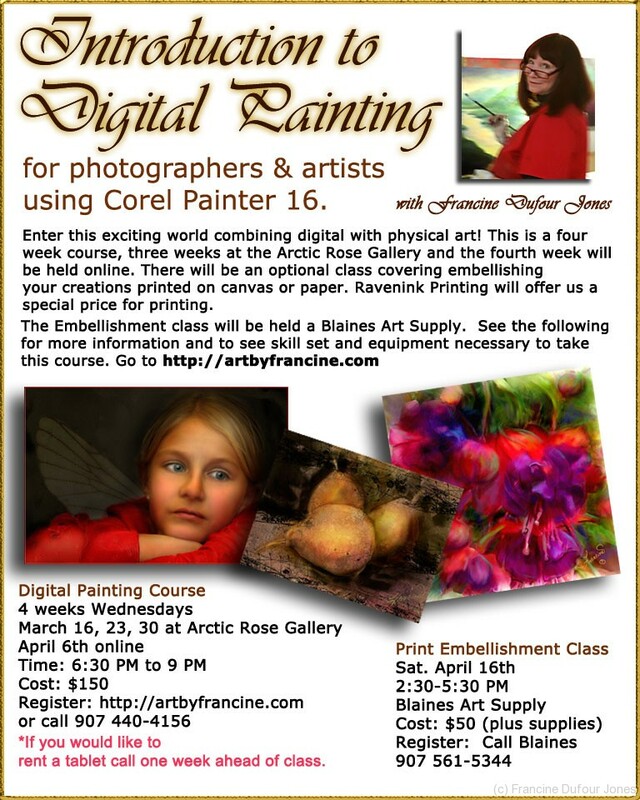 This class is for those who are new to using Corel Painter and is specifically geared toward Painter 2016. The material contained in this class will teach you how to navigate around the Painter user interface and how to use the tools the program provides so you will be able to paint digitally. You will begin with the basics and then be led gently through the process of playing with brushes, painting images and cloning photographs. In later class series you will learn how to paint portraits, pet portraits, florals, still life, and landscapes. I have been using Painter for arounds 16 years. I have used it for book illustrations, fine art prints, commissioned portraits and product licensing. You will be learning Painter as you do projects step by step. I will have tutorials and Painter resources on a special website to augment your class. You can register on this website( http://www.artbyfrancine.com) registration is now open.. Please join me as we begin this exciting adventure with is Corel Painter! How to create and name new folders. How to locate files in their computer? How to open and save files to specific locations. How to unzip files and deploy the contents? full program is $429. but you can qualify for the student version for $99. once your trial is up. I have also seen great bargains on eBay. Best Buy may still have tablets. If it is a challenge for you to get a tablet now. I suggest you stick with Wacom brand. You could rent a tablet but I need to know at least one week before class to acquire one for you. Call or email me and we can discuss this. 4 GB of Ram or better Note: For optimum performance, your system should have 8GB of Ram or better.